TORQ have been working closely with Team Blood Glucose (Team BG), a not-for-profit patient advocacy organisation providing education, support, access and opportunity for all those with, or at risk of, diabetes. 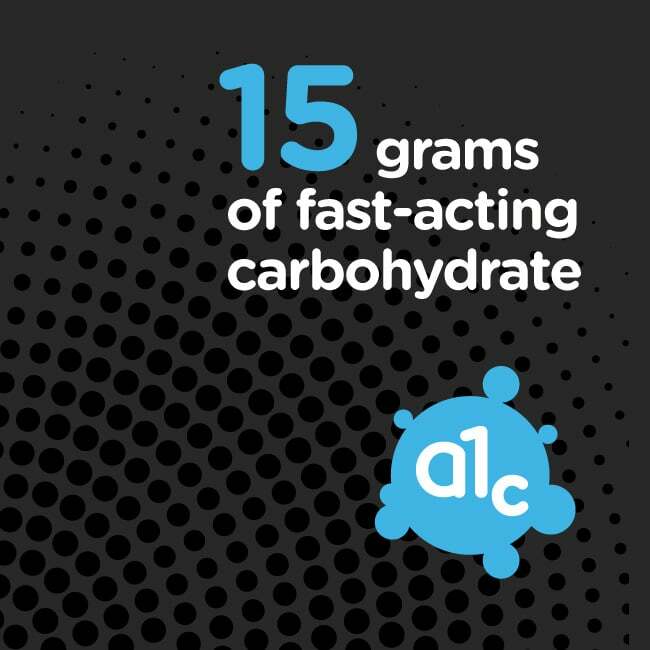 Together we have launched the A1c gel, which utilises TORQ’s cutting-edge 2:1 Maltodextrin:Fructose formulation to raise blood glucose extremely rapidly. 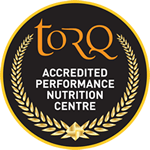 TORQ A1c Gel is a product that has been developed specifically for people with diabetes and would not have been possible without a strong partnership with Team BG, a not-for-profit organisation dedicated to supporting people with, or at risk, of developing diabetes. A 15 gram dose of carbohydrate followed by a blood glucose test 15 minutes later is recognised by people with diabetes all over the world as the accepted treatment for hypoglycaemia. TORQ have worked extensively with Team BG to incorporate the latest research (the same research used by TORQ to support rapid carbohydrate delivery into the bloodstream of athletes) into a product aimed to help people with diabetes to raise their blood glucose levels quickly and efficiently in an emergency situation. The 15 gram dose of carbohydrate is delivered via a smooth, great tasting gel formulation, packaged in a conveniently transportable tube with an easy-tear top. Accessing 15 grams of fasting acting carbohydrates has never been easier or more effective. Team BG are a not-for-profit patient advocacy organisation providing education, support, access and opportunity for all those with, or at risk of, diabetes. Their ambition is to help all be more active and live well with diabetes. For further information on Team BG, click HERE. Matt from TORQ and Paul from Team BG first started talking back in 2012, because Paul (then recently diagnosed with Type 1 diabetes) was having significant success with TORQ products, using them as fuel source during his regular exercise sessions. 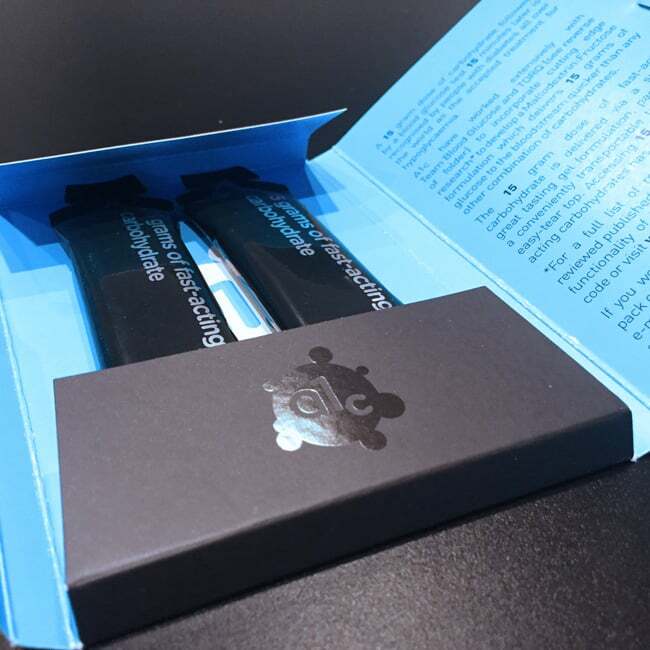 Matt had also previously received feedback over the years from other people with Type 1 diabetes praising the TORQ Gel formulation in particular for its effectiveness in raising blood sugar rapidly during a hypoglycaemic episode. It soon became apparent that a parallel existed between the needs of an athlete whilst exercising and a person with Type 1 diabetes during a hypoglycaemic episode – they both need the fastest possible delivery of carbohydrate – a formulation that will get into the blood quicker than any other. Naturally, and as a consequence, the A1c Gel was born from this a joint initiative between TORQ and Team BG. 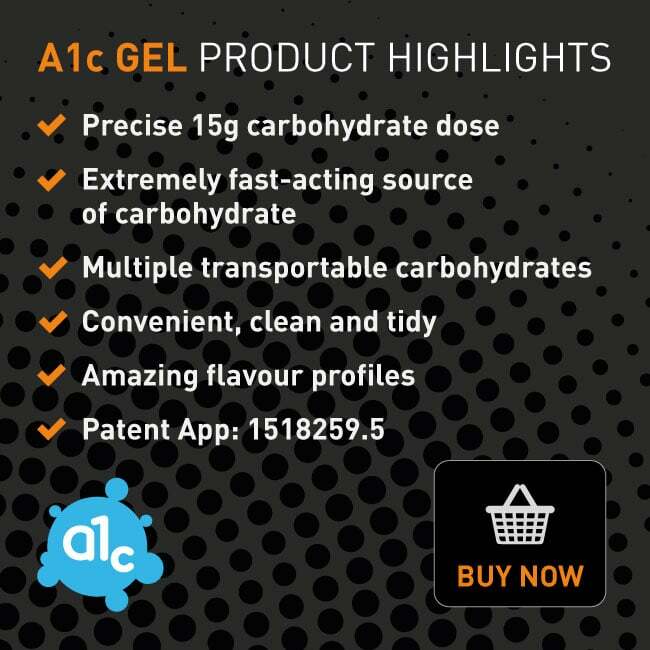 Unlike the TORQ Gel, the A1c Gel isn’t intended for use during exercise (although it could be if you wanted to use it as a measured 15g carbohydrate fuelling dose), but for the specific purpose of delivering carbohydrate in the fastest possible manner during a hypoglycaemic episode. The A1c gel represents only the start of TORQ and Team BG’s journey together however. Over the coming months, the pages of this website will continue to expand, providing information and education on how to live better with Type 1 and Type 2 diabetes and how to reduce the likelihood of developing Type 2 in the first place. The use of 2:1 Maltodextrin:Fructose (Patent Application. 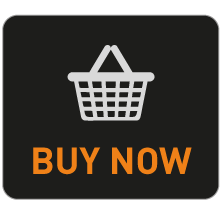 1518259.5) in this product is exactly the same formulation that we use in our TORQ Gels, which are designed to deliver carbohydrate to the blood extremely quickly in an entirely different set of circumstances. The reason this formulation works better than glucose-only preparations is most easily explained by following the two animations below. Maltodextrin is a low-osmolality glucose-derivative (many glucose molecules bonded together in a chain) and although glucose-derivatives do deliver glucose more quickly into the blood than fructose (fruit sugar), the GLUT5 transporter in the lining of the intestine quickly becomes saturated, causing the glucose molecules to queue up for absorption. Play the very short animation below, which shows how the maximum absorption rate of glucose is limited to 60 grams per hour. On the other hand, if fructose is combined with glucose at a 2:1 ratio, notice how utilisation of the SGLT1 transporter trickles fructose into the bloodstream independently of glucose, alowing a total absorption of 90 grams of carbohydrate per hour. For people with diabetes, the recognised approach to rapidly raising blood glucose levels to manage the recovery from hypoglycaemia is to consume 15g of fast acting carbohydrates, wait 15 minutes, re-test your blood glucose and then repeat if needed. To deliver A1c’s 15g dose of extremely fast-acting carbohydrates, tear off top of gel packaging and consume all the contents of the tube. Take a blood glucose measurement 15 minutes later and repeat with an additional dose if necessary. Please Note: From a long term health perspective, accomplished ‘blood glucose control’ should be the primary objective of anyone living with diabetes and this involves far more planning and education than simply taking a product to raise blood glucose during a hypoglycaemic episode. Please explore the educational pages on this website as they go live in the coming months. With solid education, hopefully you will need to use this product less frequently. It’s fair to ask the question ‘What does this product give me that a few Jelly Babies doesn’t?’. The answer is clear when you look at the detail. 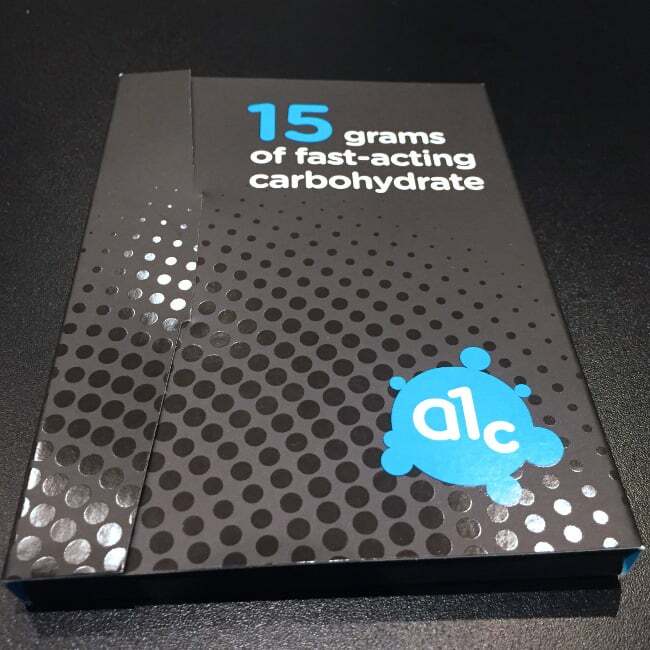 The A1c gels gives you: A faster access to carbohydrate (we can’t think of a quicker way to get 15g of carbohydrate into your stomach, especially if you’re in a position whereby you need assistance to administrate it), a faster delivery into the blood than any other method (as discussed above), a precise 15g dose, a clean and simple delivery system and a strong compact pack that’s easy to store/transport without the risk of damage or contamination.  Ingredients (Both Flavours): Maltodextrin (Glucose Polymers 43%), Water, Fructose (21%), Citric Acid, Electrolytes (Sodium Chloride, Potassium Chloride, Calcium Lactate, Magnesium Carbonate), Natural Flavour (0.2%), Preservative (Potassium Sorbate). 1. Stellingwerff, T & Cox, GR. (2014) Systematic review: Carbohydrate supplementation on exercise performance or capacity of varying durations. Appl Physiol Nutr Metab. 2014 Sep;39(9):998-1011. 2. Wilson. PB., Ingraham, SJ. (2015) Glucose-fructose likely improves gastrointestinal comfort and endurance running performance relative to glucose-only. Scand J Med Sci Sports. [Epub ahead of print]. 3. 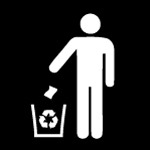 Currell, K & Jeukendrup, A.E. (2008) Superior endurance performance with ingestion of multiple transportable carbohydrates. Med Sci Sports Exerc. 40(2):275–81. 5. Tarpey, M.D., Roberts, J.D., Kass, L.S., Tarpey, R.J., Roberts, M.G. (2013) The ingestion of protein with a maltodextrin and fructose beverage on substrate utilisation and exercise performance. Appl Physiol Nutr Metab. 38(12):1245–53. 6. Rowlands, D.S., Swift, M., Ros, M., Green, J.G. (2012) Composite versus single transportable carbohydrate solution enhances race and laboratory cycling performance. Appl Physiol Nutr Metab. 37(3):425–36. 7. Baur, D.A., Schroer, A.B., Luden, N.D., Womack, C.J., Smyth, S.A., Saunders, M.J. (2014) Glucose-fructose enhances performance versus isocaloric, but not moderate, glucose. Med Sci Sports Exerc. 46(9):1778–86. 8. Rowlands, D.S., Thorburn, M.S., Thorp, R.M., Broadbent, S.M., Shi, X. (2008) Effect of graded fructose co-ingestion with maltodextrin on exogenous 14C-fructose and 13C-glucose oxidation efficiency and high-intensity cycling performance. J Appl Physiol. 104:1709–19. 9. O’Brien, W.J & Rowlands, D.S. (2011) Fructose-maltodextrin ratio in a carbohydrate-electrolyte solution differentially affects exogenous carbohydrate oxidation rate, gut comfort, and performance. Am J Physiol Gastrointest Liver Physiol. 300(1):G181–9. 10. O’Brien, W.J., Stannard, S.R., Clarke, J.A., Rowlands, D.S. (2013) Fructose–maltodextrin ratio governs exogenous and other CHO oxidation and performance. Med Sci Sports Exerc. 45(9):1814–24. 11. Rowlands, D.S., Swift, M., Ros, M., Green, J.G. (2012) Composite versus single transportable carbohydrate solution enhances race and laboratory cycling performance. Applied Physiology, Nutrition, and Metabolism. 37(3): 425-436. 12. Smith, J.W., Pascoe, D.D., Passe, D., Ruby, B.C., Stewart, L.K., Baker, L.B., et al. (2013) Curvilinear dose-response relationship of carbohydrate (0–120 g·h−1) and performance. Med Sci Sports Exerc. 45(2):336–41. 13. Roberts, J.D., Tarpey, M.D., Kass, L.S., Tarpey, R.J., Roberts, M.G. (2014) Assessing a commercially available sports drink on exogenous carbohydrate oxidation, fluid delivery and sustained exercise performance. J Int Soc Sports Nutr. 11(1):1–14. 14. Jentjens, R.L., Underwood, K., Achten, J., Currell, K., Mann, C.H., Jeukendrup, A.E. (2006) Exogenous carbohydrate oxidation rates are elevated after combined ingestion of glucose and fructose during exercise in the heat. J Appl Physiol. 100(3):807–16. 15. Jeukendrup, A.E & Moseley, L. (2010) Multiple transportable carbohydrates enhance gastric emptying and fluid delivery. Scand J Med Sci Sports. 20(1):112–21. 16. Davis, J.M., Burgess, W.A., Slentz, C.A., Bartoli, W.P. (1990) Fluid availability of sports drinks differing in carbohydrate type and concentration. Am J Clin Nutr. 51(6):1054–7. 17. Jentjens, R.L., Venables, M.C., Jeukendrup, A.E. (2004) Oxidation of exogenous glucose, sucrose, and maltose during prolonged cycling exercise. J Appl Physiol. 96(4):1285–91. 18. Jentjens, R.L., Achten, J., Jeukendrup, A.E. (2004) High oxidation rates from combined carbohydrates ingested during exercise. Med Sci Sports Exerc. 36(9):1551–8. 19. Wallis, G.A., Rowlands, D.S., Shaw, C., Jentjens, R.L., Jeukendrup, A.E. (2005) Oxidation of combined ingestion of maltodextrins and fructose during exercise. Med Sci Sports Exerc. 37(3):426–32. 20. Jentjens, R.L., Moseley, L., Waring, R.H., Harding, L.K., Jeukendrup, A.E. (2004) Oxidation of combined ingestion of glucose and fructose during exercise. J Appl Physiol. 96(4):1277–84. 21. Jentjens, R.L & Jeukendrup, A.E. (2005) High rates of exogenous carbohydrate oxidation from a mixture of glucose and fructose ingested during prolonged cycling exercise. Brit J Nutr. 93:485–92. 22. Fuchs, C.J., Gonzalez, J.T., Beelen, M., Cermak, N.M., Smith, F.E., Thelwall, P.E., Taylor, R., Trenell, M.I., Stevenson, E.J., van Loon, L.J. (2016) Sucrose ingestion after exhaustive exercise accelerates liver, but not muscle glycogen repletion compared with glucose ingestion in trained athletes. J Appl Physi. [Epub ahead of print].